A Bruckheimer-Ridley Scott film about a mission to extract a Somali warlord gone belly-up… that sounds like visual ecstasy. And it is. It is more Bruckheimer than Scott, actually, with a large armada of expensive military equipment being thrown into the ring, fabulous helicopter shots, illuminating and visually exciting aerial shots of the narrow streets of Mogadishu. You get to know some key players, you get to know the layout of the mission, you hear the code word “Irene” to get it all started… and then confusion seeps in, at some point indifference. No doubt the confusion part is intentional to a point, as it only reflects the confusion and disorientation of the staff on the ground and in the air, chasing around the city, trying to find the helicopter that was shot down, trying to get the hell out of there, trying to survive while bullets and grenades rain down upon them. That is not good for an audience, though. Editing and directing should allow me to keep ahead of the people I am watching, give me an impression of their confusion by understanding it, by seeing what they cannot see. If I do not have a better overview, I do not enjoy the movie, I feel like the first person in a shooter, bouncing about with every new image that is thrown at me. 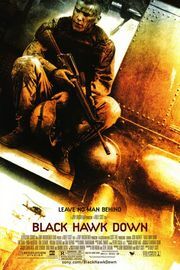 But except disorientation (which at least has some action value), the worse part about “Black Hawk Down” is the boredom that settles in during the second half. At some point, groups of people nestle down in their respective hideouts, waiting for better times, i.e. rescue. They are stuck, we are stuck with them, and as terrible is it may be to just sit there and wait, watching them sitting and waiting is not terribly exciting, just a bit dull. At this point, it would have paid off to have a more limited cast of characters, so at least you could identify with them. As Scott has hurled around some 20 lead characters at the outset, and flings them all into battle at the same time, I did not feel I had the time to identify them, identify with them, and feel their pain. They merge into a mass of dusty and bloody uniforms, only distinguished by the way they exit the scene towards the end. A shame about a film of such grandiose visuals, but direction and editing really did not help me enjoy it as much as I could have. The film was far from being the arbitrary and pointless money-burning machine a Michael Bay movie usually is, but seeing these flaws in a film by an often greater director is a bit disappointing.